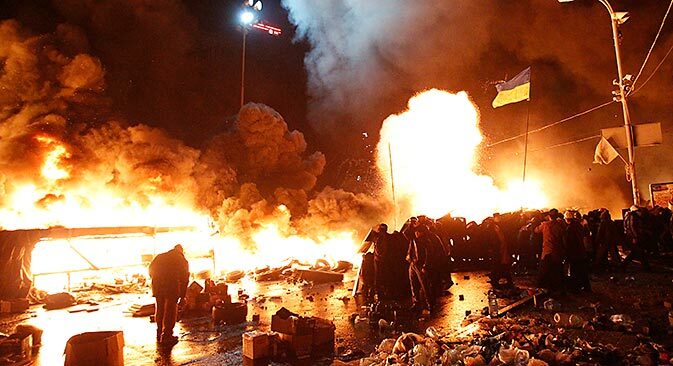 Violence erupts in Kiev with no clear path forward for Ukraine’s government and protestors. As of the morning of Feb. 19, at least 25 people had been killed in street clashes between protesters and the police in Kiev. Russian government officials have called on the Ukrainian authorities to take assertive measures in order to stop the bloodshed while experts argue that only intervention by the international community can prevent the political crisis from turning into full-blown civil war. Mikhail Margelov, head of the committee on international affairs of the Federation Council, Russia’s upper chamber of parliament, thinks that the street riots are being orchestrated by experienced professionals. Russia demands that the leaders of Maidan stop the bloodshed in their country and immediately resume dialogue with the legitimate authorities without threats or ultimatums, the Russian Foreign Ministry said in a statement on Wednesday. "Most of the Ukrainian-based commentators used to assert that the Maidan and its combat units reported to no one, that this was a naturally formed community," Margelov told journalists in Moscow. "However, the first [violent clashes with riot police] in Hrushevsky Street proved this idea wrong. The radicals were too adept at fending off the police attacks, laying their hands on riot gear, and turning Molotov cocktails into napalm with special additives." Margelov continued: "The combat actions are evidently well organized. Furthermore, the Maidan movement appears to be gaining force in Ukraine's regions after a frail truce. In Lviv, Ternopil, and Ivano-Frankivsk, [protesters] have moved from seizing administrative buildings to storming police stations and disarming Berkut [riot police] officers." Margelov did not attribute the violence to Vitaly Klitschko, the leader of the opposition party UDAR, and Arseniy Yatsenyuk, the leader of the opposition Fatherland faction in Ukraine’s parliament, saying that they hardly had the necessary military prowess to be orchestrating the current confrontation: "Their role is confined to working with the West to devise plans for the creation of an opposition government and the implementation of a constitutional reform, which should result in Ukraine receiving Western financial aid," Margelov said. In Margelov’s opinion, the top priority at the moment should be to put an end to the street clashes and resume responsible political dialogue, although he is not sure that this will be enough to unite Ukraine’s divided society. Margelov pointed out that the split in the country was evident even in parliament. “I cannot recall a single [session of the] Ukrainian parliament in which the members did not resort to fistfights." "Troops should be brought into Kiev, a state of emergency should be declared, and the government should act in accordance with the law of war," Morozov told Russian news agency RIA Novosti. Alexey Pushkov, head of the Russian State Duma committee on international affairs, is convinced that U.S. Vice President Joe Biden's call to Ukrainian President Viktor Yanukovych to practice restraint is a "signal" to the extremists. "Biden called on Yanukovych, but not on the extremists, to manifest 'maximum restraint'!" Pushkov tweeted on Feb. 19. "This sent another signal of U.S. support to the extremists." Alexei Vlasov, executive director of the Sever-Yug analytical center in Moscow says that only pressure on the part of the international community can resolve the political crisis in Ukraine. "Without Western pressure on the opposition, it will be impossible to keep the process on the negotiation track, because in that situation, radicals will feel impunity and will keep crossing the line which separates politics from chaos," said Vlasov. "If an external force, impersonated by Russia, the EU, and the U.S., fails to influence the political situation in Ukraine, I fear that the situation will approach the verge of civil war, which would be the most terrible scenario."